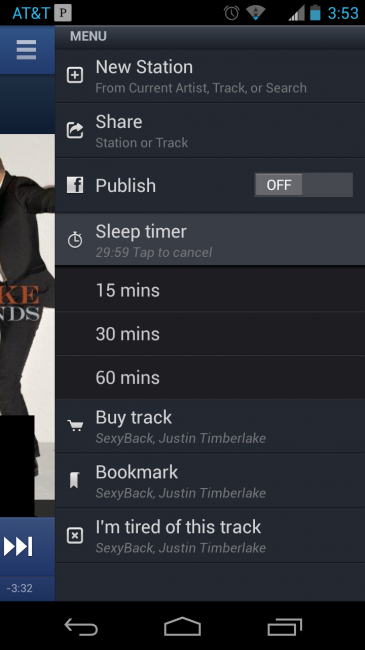 Pandora issued an update on Android this afternoon that introduced a new Sleep Timer feature. Located in the options drawer at the top right, users can select from 15, 30, or 60 minute timers that will shut the service down, so that you can go to sleep and not wake up with Pandora having been playing for 8 hours. They are also including compatibility with Nissan touch screen and steering wheel controls in select Nissan vehicles. Fall asleep to the sounds of your favorite stations with our new Sleep Timer feature. Find the Sleep Timer in your options drawer in the top right screen corner and select from 15, 30, or 60 minutes. Drift off knowing we’ll play just the right amount of music for you. Easily control your music using Nissan’s touch screen or steering wheel controls in select Nissan vehicles that now support Pandora through the NissanConnect App. For more information please visit NissanUSA.com/connect.